Vembu Technologies, through its Vembu Pro Online Backup and Cloud Storage Services offerings, enables Managed Service Providers (MSPs) and Value Added Resellers (VARs) to provide a cost-effective and fully brandable online backup service to their SMB Customers. Vembu, which has over 2000 service provider partners worldwide, is headquartered at Chennai, India. Vembu Pro provides a business-focused online backup service. Under the hood of Vembu Pro is Vembu’s StoreGrid online backup software, which can be hosted on the service provider’s own data centers and can be offered as a fully managed online backup service to business customers. Before moving to Amazon Web Services (AWS), Vembu focused solely on licensing the StoreGrid software to service providers who hosted it themselves in their data centers and offered their own online backup service to clients. But Vembu leadership knew that growing its business would require a highly scalable and redundant infrastructure - one that would help them keep costs low as the company grew. Vembu chose AWS as its cloud services provider primarily for the near-infinite on-demand scalability potential of both the AWS computing and storage infrastructures. The AWS pay-as-you-go utility pricing also helped make AWS a compelling choice, as it eliminates the capital spending associated with building an infrastructure. 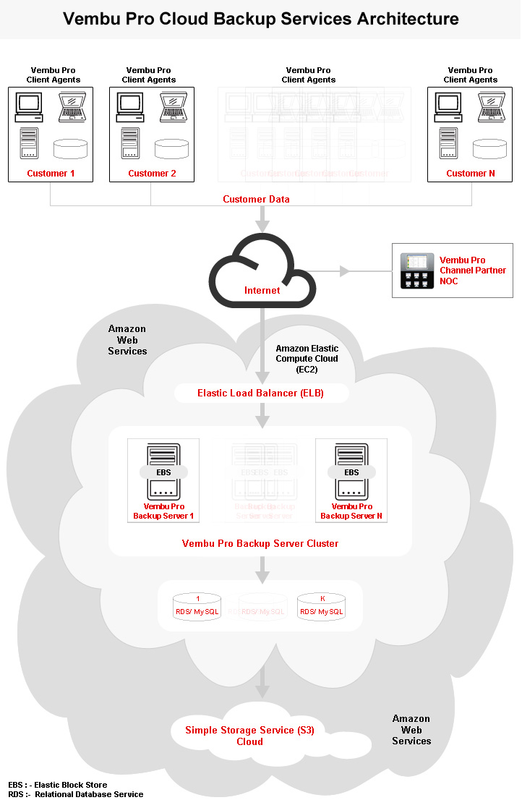 Vembu Pro online backup service uses Amazon Elastic Compute Cloud (Amazon EC2) to host the Vembu backup Server Clusters and MySQL database servers in Amazon’s US East Coast and Europe Regions. Vembu also uses Amazon EC2 for internal testing infrastructure to test StoreGrid software on scalable loads. Currently, Vembu has around 30 instances running on Amazon EC2 for various purposes such as Quality Assurance, Load Simulation, Functionality Testing and the, Staging and Production Environment for the Vembu Pro Online Backup Service. Amazon Simple Storage Service (Amazon S3) serves as the primary storage back end for Vembu customers’ backup data uploaded to Vembu backup server clusters. Amazon Elastic Block Store (Amazon EBS) temporarily caches uploaded backup data to the Vembu backup server clusters and maintains persistent storage of the MySQL databases that store customers’ account details, backup metadata, reporting data, etc. The following diagram illustrates how AWS is incorporated into the Vembu Pro architecture. “Vembu Pro Online Backup Services would not have been possible without the AWS ‘pay-as-you-go’ pricing model,” says Sekar Vembu, CEO of Vembu Technologies. Using the AWS Cloud to host Vembu Pro online backup services reduces the resources required for maintaining servers with storage infrastructure. ”Amazon’s Service Level Agreement (SLA) and data center security provide us with enough clout to compete with the best in business without a similar upfront cost,” Vembu says. AWS has also decreased the time required to host Vembu’s complex solution across two continents (North America and Europe) and offers them the opportunity to add two more continents (Asia and Australia) on just a day’s notice. Vembu highly recommends Amazon’s forums and support resources, where discussions are constant and active. Vembu found the AWS team and the abundant AWS developer community very helpful in finding the right resolutions for specific issues. To learn more about backup and storage on the AWS Cloud, visit our Backup and Storage detail page: http://aws.amazon.com/backup-storage/.